All transactions are safe and secure with a reliable history in online purchasing behind each of our associates. 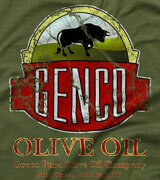 Buy the Genco Olive Oil t-shirt to own Godfather clothing and merchandise. At a young age, Vito Corleone befriended Genco Abbandando in New York after being adopted by Genco's family. Genco became like a brother to Vito, and years later they started an olive oil business together, Genco Importers. Genco Olive Oil Godfather t-shirts available here advertise Vito's business, which he used as a legal front for his organized crime syndicate. Look for the Genco logo on Godfather hoodies, mugs, and other clothing. In addition to the Genco Olive Oil tee above, browse the Godfather Clothing Gallery for more apparel like men's and women's clothes, kids shirts or hoodies.